Roku was kind enough to send us their Roku HD digital video player to review. This player was also originally referred to as the Netflix player by Roku. The Roku “set top box” allows you to view streaming internet video on your TV, bridging the gap between the living room and the internet. The Roku HD player currently supports the Netflix Instant Viewing service and the Amazon Video On Demand service. Over 50,000 TV episodes & films are available to watch instantly using the supported services. Amazon VOD was recently added via a firmware update, so we are hoping that additional services will be supported in the future as well (Hulu & YouTube please!). Let’s take a look at the devices specifications. Roku HD review: What’s inside the box? 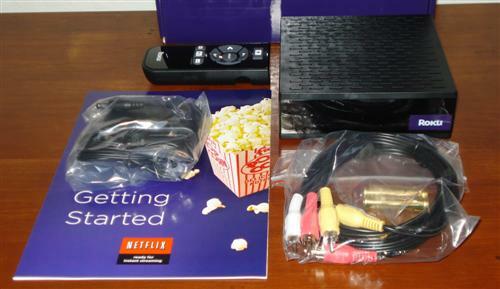 The package includes the Roku HD digital video player itself (top right), a remote control (top left), power adapter (mid left), a getting started guide (bottom left), composite video cables & batteries for the remote (bottom right). To give you a look at the user interface, the usability of the device and some of the available Netflix instant viewing titles, we recorded the video below. Overall, we are extremely happy with the performance of the Roku HD digital video player with Netflix and we highly recommend it. Connecting and setting up the player is easy, the performance is solid and the value of having thousands of on-demand movies & TV shows for a low monthly fee is unmatched anywhere else (Netflix plans $8.99 and up include unlimited instant viewing). Our biggest complaint that we have about the Roku HD box is that Netflix instant viewing titles must be added from a computer. You cannot browse and view available streaming content options directly from the Roku HD player itself. The player has performed extremely well in our months of testing, with relatively little problems. The few playback problems we did experience can most likely be attributed to local network connectivity problems at our home or temporary Netflix instant viewing server problems. The majority of our viewing experience with the Roku HD box has been over a WiFi connection and the performance and reliability has been solid. If you already have a Netflix subscription and you need a bridge between the internet and your TV, the Roku HD player is a no brainer. Do yourself a favor and pick one up today, you won’t regret it. If you don’t have Netflix, I recommend that you subscribe and pick up a Roku player for hours and hours of on-demand entertainment (with DVD’s by mail as a side bonus). You can purchase one directly from Roku or at Amazon. Its bad that there is no power off option. But i admire the player for its other features. So how well did the WiFi work???? The WiFi on the Roku player works very, very well. I haven’t connected it using wired internet yet. I am probably going to go for one of the roku digital player. Is there any way to burn what you watch on Roku to a dvd? Yes. You will need video capture software. What kind of software and how do I do this? From my TV or computer? You wouldn’t need a Roku box for this, however.